You are currently browsing the tag archive for the ‘conference news’ tag. Marketing executive Tania Haigh, most recently the lead for women and moms marketing initiatives at McDonald’s USA, today announced the launch of Magnolia Insights, Inc., a marketing strategy firm specializing in marketing to women and moms. A 15-year marketing industry veteran with a decade of insight gleaned from various roles at McDonald’s USA, Haigh aims to better position brands by addressing the lag in effective marketing to women and moms. Haigh, along with her co-presenters Julie Wenger of McDonald’s and Sweta Kannan of DDB, won the Take The Cake Best Speaker award at the 2014 M2W® – The Marketing to Women Conference, for their session “W.O.W. Winning Over Women at McDonald’s”. In 2014, Haigh was named a “Top 40 Under 40 Marketer” in the Midwest by Brand Innovators, an industry trade organization. “Magnolia Insights is great partner when it comes to providing expertise around the unique habits and behaviors of moms,” said Anna Kassoway, CMO of Crowdtap, The People-Powered Marketing Platform. Members of the board of Bcureful present their donation to the staff of the Tuberous Sclerosis Center at Ann & Robert H. Lurie Children’s Hospital of Chicago. After attending M2W® in 2011, Julie Scroggins, VP & CFO of family-owned and operated Waukegan Tire and Supply Company in suburban Chicago, was inspired by the women she heard on stage and decided it was time to do something she had been thinking about for a while – she launched Bcureful, a non-profit organization whose mission is to accelerate research towards a cure for Tuberous Sclerosis Complex (TSC) and raise awareness about this genetic disorder that her own daughter had been diagnosed with a few years earlier. She was awarded the Full Circle Award in 2012 which is given to marketers or business leaders who have best demonstrated how the M2W conference has positively impacted their work or has given them the impetus to start something new. In Julie’s case, she created something where once there was nothing. As of today, Bcureful has made contributions to the Comprehensive Epilepsy Center at NYU Langone Medical Center for TSC research and to Lurie Children’s Hospital of Chicago to aid in the development of their new TSC Center. Visit Bcureful.org to learn more about TSC and the road to a cure. M2W® 2014 Supported Girl Scouts of the USA, and Kelly Parisi, Chief Communications Executive for Girl Scouts, spoke at the closing luncheon about their engagement with the Ban Bossy campaign developed by Sheryl Sandberg. Members of a Chicago-area Girl Scout troop attended the lunch as guests of M2W®, and in a surprise announcement, accepted the annual “This Woman Means Business” award (which was changed for the occasion to “These Girls Mean Business”) on behalf of all the Girl Scouts of the USA, who are making a difference in the quality of our world. M2W® Co-founder Nan McCann mentioned that Juliette Gordon Low, founder of Girl Scouts, once said, “Scouting rises within you and inspires you to put forth your best.” In the Ban Bossy campaign, and in everything they do, Girl Scouts of the USA are putting forth their best. Who M2W will honor and support in 2015? 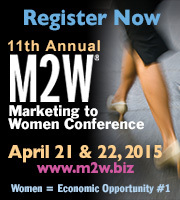 Register now for the 11th Annual M2W® – The Marketing to Women Conference to find out! “While women are incredibly sophisticated and complex, marketing to them doesn’t have to be,” said Tinesha Craig, division director of M2W® 2013 sponsor Insights In Marketing’s i-on-Women™, referring to her firm’s new e-book that educates marketers on how to effectively target women. The book, Getting Women to Buy: Better Insights to Transform Your Marketing, ventures outside the traditional marketing research box and provides valuable information to marketers about exactly what women want and how to give it to them. Women account for 85% of all consumer purchases, including everything from health care to automobiles, and will spend nearly $7 trillion annually by 2020. And yet, according to research from Insights in Marketing’s i-on-Women™ team, only 9% of women and 13% of moms feel that marketers are effectively communicating with them. Because of this, marketers are missing out. “Getting Women to Buy” aims to change that by helping marketers understand the underlying motivations behind her behaviors. Today, many medium-to-large companies rely on demographics, attitudes and purchase history to target consumers in marketing campaigns. According to research from i-on-Women™, the true competitive edge lies in understanding who she is at her core. Getting Women to Buy is the first step toward that understanding. Register now for M2W® – The Marketing to Women Conference 2014 and get the best savings – 30% (nearly $600!). Use code earlybird30WP at M2W.biz by December 20, 2013. M2W® is the world’s premier conference on marketing to women. Since its founding in 2005, the event has been attended by thousands of senior-level brand managers and marketing executives from Fortune 500 companies representing major consumer product and service categories, including financial services, healthcare, automotive, housing, pharmaceutical, F&B, electronics, travel, retail, fashion, HBA, etc. M2W®‘s program features keynotes, general sessions, workshops, receptions and special events. Highlights include case studies and how-to sessions on topics such as media, creative, research, packaging, purchasing habits and point-of-sale interaction. Sponsors include media, marketing services, ad agencies, associations, government, research companies, mom-focused brands, telecom, high tech, etc. Check out video from last year’s conference, and Register Now! The M2W® award ‘You Take The Cake’ is an annual award given to speakers who present the most innovative insight and information on how to improve sales and marketing results with today’s women. The winners were chosen by the M2W® audience of esteemed marketers immediately following its annual conference held in Chicago on April 16 and 17. Insights in Marketing’s i-on-Women™ team’s session not only highlighted engaging research, it also conveyed what M2W® is all about and why brand marketers attend the conference. M2W® is known for drawing attendance from a who’s who of Fortune 1000 brands, including Harley-Davidson, Sears, Avon, Abbott, Meijer, Allergan, TIAA-CREF, Kimberley-Clark, Kellogg’s, Mead Johnson, GM, Allstate, Heinz, BBC, NBA, Procter & Gamble, Wyeth and Coca-Cola. M2W® is the world’s premier conference on marketing to women. Sponsors for the 2013 conference include Associate Sponsors: GfK, Linkage Research, AOL’s Daily Finance, Willoughby Design, Whitaker International, Anthem!, Mabel’s Labels, Conill, General Growth Properties and House Party; Workshop Sponsors: TRIS3CT, Insights in Marketing, LLC, Iron Girl and The Pert Group; and Showcase Sponsors: Havas Worldwide, Kimpton Hotels and Restaurant Group, PMP, Today’s Chicago Woman, MEplusYOU, Female Factor, Healthy Initiatives Foundation, Lifescript, Snippies, Paramount Market Publishing and Carolina Pad. M2W® is wholly owned, managed and produced by PME® Enterprises, LLC. For more information about M2W® visit http://www.m2w.biz or call 860.724.2649 x11. To learn more about Insights in Marketing and its i-on-Women™ team, visit www.insightsinmarketing.com or call 847.512.9840. Insights in Marketing, LLC (IIM) is a full-service marketing research consultancy dedicated to uncovering and translating consumer insights into clear, actionable direction. IIM’s experienced, senior-level consultants leverage creative qualitative and quantitative research techniques to help clients better understand consumers and gain a competitive edge. For more information about IIM, visit the IIM website, blog, LinkedIn, Facebook page and Twitter feed. M2W® is the world’s premier conference on marketing to women. Since its founding in 2005, the event has been attended by thousands of senior-level brand managers and marketing executives from Fortune 500 companies representing major consumer product and service categories including financial services, healthcare, automotive, housing, pharmaceutical, F&B, electronics, travel, retail, fashion, HBA, etc. The M2W® program features keynotes, general sessions, workshops, receptions and special events. Highlights include case studies and how-to sessions on topics such as media, creative, research, packaging, purchasing habits and point-of-sale interaction. Sponsors for the 2013 conference include Associate Sponsors: GfK, Linkage Research, Willoughby Design, Whitaker International, Anthem!, Mabel’s Labels, Conill, General Growth Properties and House Party; Workshop Sponsors: TRIS3CT, Insights in Marketing, LLC, Iron Girl and The Pert Group; and Showcase Sponsors: MEplusYOU, Female Factor, Healthy Initiatives Foundation, Lifescript, Snippies and Carolina Pad. Sponsors for the 2013 conference include Associate Sponsors: GfK, Linkage Research, Willoughby Design, Whitaker International, Anthem!, Mabel’s Labels, Conill, General Growth Properties AOL Daily Finance, and House Party; Workshop Sponsors: TRIS3CT, Insights in Marketing, LLC, Iron Girl and The Pert Group; and Showcase Sponsors: Kimpton Hotels & Restaurant Group, Today’s Chicago Woman, MEplusYOU, Female Factor, Healthy Initiative Foundation, Lifescript, Snippies and Carolina Pad. M2W® is produced by PME® Enterprises LLC. PME® is a sales and marketing agency with a special emphasis on conferences, events and expositions. PME®’s services include: advertising, conference, exhibit and sponsorship sales; content development and consultation for meeting programs; sales consultation; custom events and meetings, event marketing and promotion; event production and management. “We’ll tap the insights from our new study of three generations of women to show brand marketers how to build stronger, longer lasting connections with women,” said Kathy Oneto, Vice President, Brand Strategy, Anthem Worldwide. Oneto will be accompanied by Jim Lucas, Anthem’s EVP, Global Director, Insights and Strategy in their presentation of Anthem Worldwide’s new research at the 9th annual M2W® – The Marketing to Women Conference, April 16 & 17, 2013, Chicago Cultural Center. “The study showed that 82% of women agree that “there will be negative consequences if I don’t take care of my health”, and 74% of them are motivated to be healthy,” according to Oneto. “For these reasons, amongst others, we wanted to better understand what women really want from Health & Wellness across three generations of women, Millennials, Generation X, and Boomers, and how brands can help them realize the benefits, from functional to emotional. Sponsors for the 2013 conference include Associate Sponsors: GfK, Linkage Research, Willoughby Design, Whitaker International, Anthem!, Mabel’s Labels, Conill, General Growth Properties AOL Daily Finance, and House Party; Workshop Sponsors: TRIS3CT, Insights in Marketing, LLC, Iron Girl and The Pert Group; and Showcase Sponsors: MEplusYOU, Female Factor, Healthy Initiative Foundation, Lifescript, Snippies and Carolina Pad. Marti Barletta, author of the seminal book, Marketing to Women, who Time Magazine referred to as “the Chief Rabbi of the Sheconomy”, will interview Gemma Cernuda- Canelles at the 9th annual M2W® – The Marketing to Women Conference, April 15 – 17, 2013, Chicago Cultural Center. Cernuda-Canelles is the Founder of Peix&Co, the first marketing to women company in Spain. 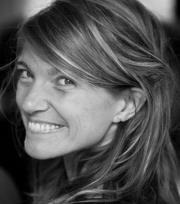 She has recently authored, “Ellas deciden…(Pero ellos todavía mandan)” – or – ”Women decide… (But men run the business)”. It is the first book to be written in Spain, in Spanish, on the topic of marketing to women. Sponsors for the 2013 conference include Associate Sponsors: GfK, Linkage Research, Willoughby Design, Whitaker International, Anthem!, Mabel’s Labels, Conill, General Growth Properties AOL Daily Finance, and House Party; Workshop Sponsors: TRIS3CT, Insights in Marketing, LLC, Iron Girl and The Pert Group; and Showcase Sponsors: MEplusYOU, Female Factor, Healthy Initiatives Foundation, Lifescript, Snippies and Carolina Pad.